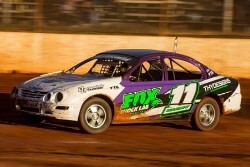 Josh Harm has won the biggest event of his career, when he won the Queensland Production Sedan Title on Saturday night at the Fraser Shores Maryborough Speedway. On an action packed night of racing, which saw several spectacular incidents, it would be Josh Arthur and Jim Cowley who would occupy the front row for the forty lap decider. Josh Harm and Brett Barron would start on row two, while the defending Champion Chris Pagel would start on the third row. Meanwhile, National Champion, Joel Berkley had a horror run in the qualifying heats, failing to finish the first two and was forced to come through the B Main, which he eventually won, ultimately having him start from position seventeen in the A Main. Cowley would lead the opening laps in a frantic start, which wold see Josh Arthur shuffle back through the running order, with Harm moving immediately to second, with Chris Pagel taking third position. Harm made the move on Cowley to take the lead, and soon after Pagel followed. Brody Fraser who started on the fourth row, found himself in third place after eight laps as the race found a rhythm. Undoubtedly, the hard charger of the race was Berkley, who after ten laps had moved to fifth place, passing twelve drivers along the way. Brody Fraser, who was having a good battle with Chris Pagel got the better of the exchange on lap thirteen to move to second, and soon after Berkley replaced fourth placed Cowley as the National Champion continued his surge towards the front. Positions after this point remained close yet stable although, Pagel and Berkley who were racing hard and fast, swapped positions several times as the race entered the final ten laps. Harm though, remained at the front, leading Fraser by four to five car lengths through the concluding stages, and thoroughly deserved the victory. Fraser chased all the way to be a credible second, just ahead of the National Champion, Joel Berkley who finished third. Chris Pagel in the concluding stages had to hold off Brett Barron, with just 0.026 separating the pair on the line for fourth, with Aaron Sander finishing in sixth place.